Marketers of consumer tech products are favouring market pricing strategies over the skimming or penetration strategies recommended by theorists, a recent study published by academic journal Marketing Science has found. 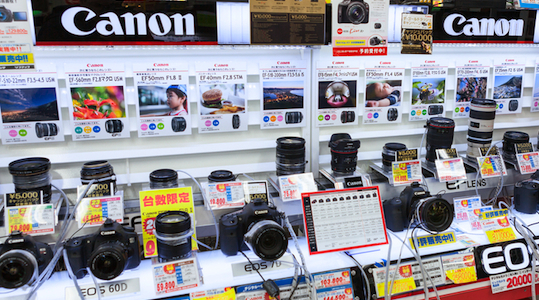 The study compared the pricing strategies used to market 663 models of digital cameras for consumers, spanning 79 brand names by 74 firms, in “one major European country”. The paper, ‘Skimming or Penetration? Strategic Dynamic Pricing for New Products’ was authored by Martin Spann of Ludwig-Maximilians-University Munich, Marc Fischer of University of Cologne and UTS Business School, Sydney, and Gerard J. Tellis of University of Southern California. “The authors find that, despite numerous recommendations in the literature for skimming or penetration pricing, market pricing dominates in practice,” the paper says. 20% of products used penetration strategies, usually by launching at 18% below the market price with subsequent decreases relative to the market price. Companies used different strategies across their wide portfolios of products, with late entrant products more likely to use market pricing, firms with market reputation most likely to use skimming, and those with larger cumulated sales the most likely to use penetration strategies. Skimming and penetration strategies are recommended by well-regarded marketing theorists including Philip Kotler and Gary Armstrong (Principles of Marketing, 2012); Thomas Nagle, John Hogan and Joseph Zale (The Strategy and Tactics of Pricing: A Guide to Growing More Profitably, 2011); and Kent Monroe (Pricing: Making Profitable Decisions, 2003). to exploit the low price sensitivity of ‘innovator’ consumers. Theorists advise companies that have some source of competitive protection should use this strategy with products that appeal to customers who are less price sensitive. Penetration pricing is recommended for products that are less differentiated that appeal to customers who are more price sensitive. The results found that despite the advice, players in the digital camera market are most often launching their products at market prices. “Generalizations of optimal pricing strategies drawn from analytical models may not hold in real, complex, and dynamic environments characterized by a large number of differentiated brands and products with intense competition plus many new product introductions,” the authors write, suggesting the need for an in-depth analysis of market response to dynamic pricing strategies. They add that the firms studied did not show any kind of ‘idiosyncratic preferences’ for using particular strategies. Penetration pricing and price skimming used with different products within a portfolio can complement and cross-subsidise each other, they add. The report warns against generalising the results to other markets and products but suggests “the results may extend to other modern consumer markets such as video games, cars, TVs, mobile phones or computers”.